December's issue of Digital Output magazine showcased Hot Trends in Hot Temps. Textiles were included as a trend, and our backlit polyester media was included in the article with an image from SGIA Expo's Orlando show. The magazine's image, also at right, is from the Digital Textile Printing Zone at the expo. The picture shows our Impact Prime backlit polyester on a backlit display by Rexframe. Top Value Fabrics was a proud sponsor of two educational zones at SGIA, one of which was the Digital Textile Printing Zone. The image shows a portion of the oversized welcome display that greeted visitors. 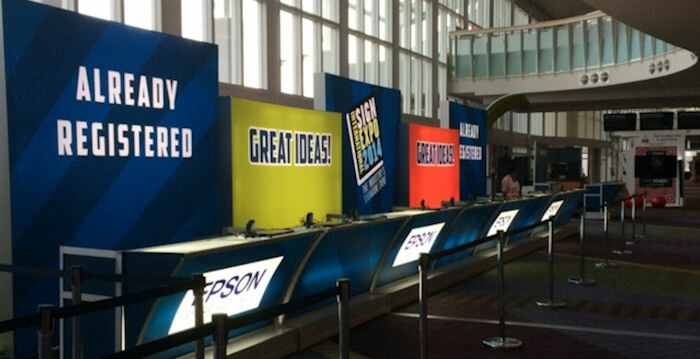 We were pleased to provide our backlit polyester for the show, and to work with such terrific industry partners. We were also delighted to hear enthusiastic praise from attendees, both for our products and for all of the technology on display in this educational zone. Due to the advancements in our industry taking place so quickly, numerous attendees commented that it was very valuable to see innovative products and techniques in SGIA's specialty zones. Learn more about the newest advancement in backlit polyester, Impact Prime, by clicking here or calling us today toll free at 855.618.4500.